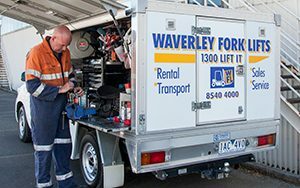 Whether you need to hire a forklift short term or rent multiple forklifts long term, Waverley Forklifts can cover all of your material handling needs. 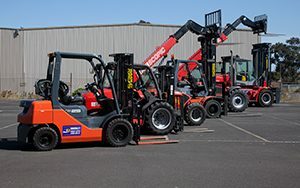 We pride ourselves on having the best forklift fleet in Australia, with all machines being late model equipment with log books, service records and manuals, all ready to work in any situation. At Waverley Forklifts, we pride ourselves on the quality of our service and repairs. We have a fleet of mobile technicians available to visit your site, or we can arrange for your forklift to be repaired in our modern Workshop. We sell a variety of used equipment, with machines to suit all budgets. Whatever your specific requirements may be, we will be happy to advise and supply you with the most suitable forklift for your needs. 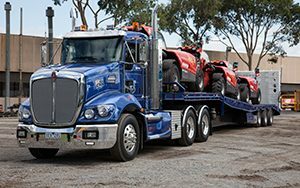 WFL Transport moves forklifts and access equipment across Melbourne and throughout Victoria on a daily basis. Our fleet of tilt trays, low loaders and customised trailers provides our customers with the most comprehensive service within the industry. 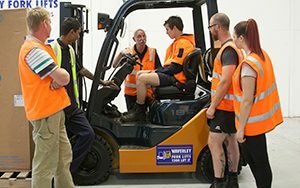 WFL Training & Assessment can offer training solutions that work for your business, including courses for forklifts and access equipment. Customised courses delivered by our fully qualified trainers can take place either at your own site or at our fully equipped Mt Waverley training facility. We have you covered for all of your casual hire and long term rental requirements. Our expert team can service and repair all forklift makes and models, either on-site or in our modern workshop. 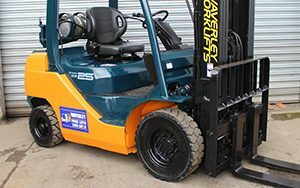 We have a comprehensive range of quality used forklifts and equipment available for sale. With our large fleet of trucks and years of specialist experience, you can trust us to transport your forklifts and access equipment. Our qualified trainers deliver customised forklift and machinery training solutions to suit your needs. For over forty years we have been a leading independent forklift company who specialise in providing our customers with the best possible forklift product. With branches in Melbourne, Sydney, Queensland and South Australia, we are equipped to offer customer service that is second to none. Whether you require forklift hire and rental, sales, service, training or machinery transport, Waverley Forklifts is the place to go – we supply a complete solution to your material handling needs. We pride ourselves on our exceptional customer service, and work hard to ensure that our commitment to honesty and respect is demonstrated each time you contact Waverley Forklifts. We do whatever it takes to ensure your total satisfaction. This is what we refer to as the Waverley Way.